This is what it will look like if you try to add a new contact to your list. The user interface for new Google Android 1.5 is looking similar to iPhone applications and i think Google is trying hard to make it a standard set which is already familiar to many iPhone users. Check how they have made the UI different and less cumbersome, the first image is in Android 1.1 and the second image is how the Add Contact will look in Android 1.5. There are other important changes as well which i am listing below. You can see in this example that the buttons and checkboxes have a new appearance. Even though these changes do not affect binary nor source compatibility, they might still break the UI of your apps. As part of the UI refresh, the minimum size of some of the widgets has changed. For instance, Android 1.1 buttons have a minimum size of 44×48 pixels whereas Android 1.5 buttons now have a minimum size of 24×48 pixels. The image below compares the sizes of Android 1.1 buttons with Android 1.5 buttons. If you rely on the button’s minimum size, then the layout of your application may not be the same in Android 1.5 as it was in Android 1.1 because of this change. This would happen for instance if you created a grid of buttons using LinearLayout and relying on the minimum size yielded by wrap_content to align the buttons properly. This layout could easily be fixed by using the android:layout_weightattribute or by replacing the LinearLayout containers with a TableLayout. Consider all the options carefully before upgrading as the new UI may break your existing application. Buttons and check boxes have been tweaked with a simpler, streamlined look that would seem to make it easier to sort through various fields but could present problems for application developers who wrote their apps with the older button fields in mind. Of course, that’s why companies release things in beta, and the tweaks should be relatively easy for developers to incorporate into their apps before the OS goes live. It shows, however, that the UI for Android is still very much a work in progress and could evolve further before Android 2.0 comes out. Google Android 1.5 Software Developer Kit (SDK) is released for the programmers. Now they have access to several new features, such as video support and a faster browser that will appear in a forthcoming version of the company’s open-source mobile-phone operating system. Google Open Handset Alliance is here to stay and they are competing against Apple’s iPhone OS, Nokia’s Symbian, and Microsoft’s Windows Mobile. HTC is the only maker who is providing handsets more will come as the time progresses. Video recording and playback, and videos can be uploaded to YouTube. Stereo Bluetooth and auto-pairing for better Bluetooth headset support. “Much faster” acquisition of location through the GPS system. More widgets on the home screen, including a music player and picture frame, along with the current search and clock widgets. 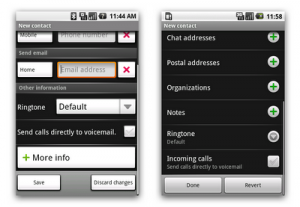 User interface improvements to messaging, Gmail, calendar, browser and other applications. The Gmail application supports batch operations so multiple messages can be deleted or archived at once, for example. Applications can rotate when the phone’s accelerometer detects a new orientation. Faster camera start-up and operation. Photos can be uploaded to Google’s Picasa photo-sharing site. User photos in the contacts application. APIs for recording and playing back audio and video. A text prediction engine to speed typing. Some support for the OpenGL graphics technology. A framework for speech recognition. APIs for widgets on the home screen and frameworks for various widgets. A framework to make it easier for background processes to interact with running applications’ interface processes. Google Android 1.5 is looking great but its expected to come out by end of April so be prepared and gather all the resources to get going. Have you started working with Android 1.5? If yes, then please share your experiences, problems etc. with us. If you’ve got any thoughts, comments or suggestions for things we could add, leave a comment! Also please Subscribe to our RSS for latest tips, tricks and examples on cutting edge stuff.